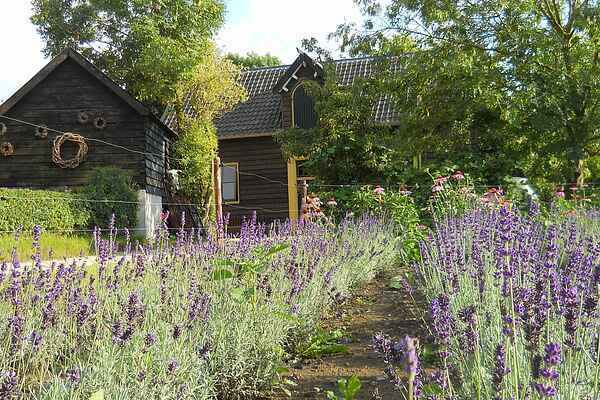 This authentically renovated carriage house next to house 't Geyn, is situated on the Noordenhoek estate on the north side of the Betuwse dike village Deil. The estate is bordered by a meander of the river Linge. The carriage house has a private terrace in the orchard with a great view over the countryside. The seclusion of the trees surrounding the yard offer this country house plenty of privacy. The house is tastefully decorated with a country kitchen with French doors to the terrace. The large living room, the second double bedroom with ensuite bathroom (the bathroom is also accessible from the living room) and bedroom with three 1-beds are located on the first floor, which is reached via a steep staircase. The carriage house has internet connection via various fixed cables, there is no Wi-Fi! At the supermarket in the village or at LaPlace nearby you can find WiFi. At the opened Appeldijk of Estate Noordenhoek there are historic tall trees. On the horizon stands the old windmill 'Butterfly' with on the other side of the Linge Estate Mariënwaerdt. During summer this estate is reachable with a bicycle pound from the next village Enspijk and has a pancake house and estate shop. The rural and peaceful surroundings of the Betuwe is known for its orchards and offers plenty of opportunity to make walking and cycling. Canoeing on the Linge is possible too. The places Beesd, Geldermalsen or Culemborg is definitely worth it. The Noordenhoek estate adjoins the Marienwaerdt estate with its pancake house, country store and various opportunities to engage in outdoor activities. The bedrooms in the house have new box springs beds and mattresses. All beds have been fully made-up upon arrival with the finest linen, while a surprise awaits you! Also included are maps listing all local activities as well as walking and cycling maps, including a detailed map of the Noordenhoek estate. All information with regard to the area can be found in the house. WELCOME! !